Before I'm 31: Riverwalk. Run. And on Sunday she rested (again). Sunday I got up to run it, but changed my mind and churched it instead. I could have probably done both had I put forth slightly more effort. Saturday's long run was really good. I know that I have been enjoying the "eating all I want and not worrying about gaining any weight" aspect of marathon training, but I may have been enjoying it too much. I think it has all gone to my thighs. Specifically, the area inside my thighs right where my shorts fall. I may have to invest in some of that body glide stuff that I always hear so much about. Or maybe some new shorts. So I did have some rubbing issues on the long run, but that was really the only problem. I did an out-and-back route on the Riverwalk here in town. As the name implies, this trail is right next to the river. 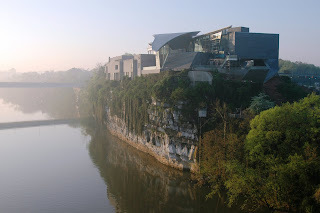 It's really a loverly route, except for the small section that runs alongside of a tiny sewage treatment plant (the picture is of an art museum on the route, not an architecturally stunning sewage treatment plant). I used that time to really breathe through my mouth instead of my nose. I love an out-and-back route. I have a huge mental thing about a halfway mark. 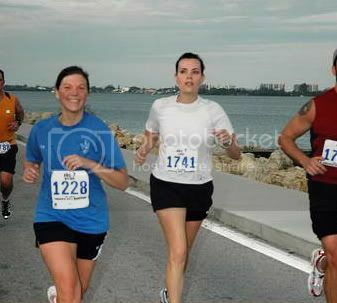 During my half-marathon, I knew that once I got past the 6.5 mile marker, I could make it. Maybe that whole metaphorically "downhill from here" mindset. As I was shooting for a 70 minute run (I ditched the idea of a 90 minute run, based mainly on the advice of a marathoning friend who said it was too big of a jump from last weeks' 60 minute long run), I got on the trail and just ran for 35 minutes, not worrying about the distance at all. I got to the 35 minute mark and took about a minute's rest to drink some water, and then I headed back for home (okay, actually to the parking lot where my car was). I did have to walk a few times during the "back" part of the run, but I finished strong, and my overall time was 72:12. So even with the walking I only added 2:12 to my return trip. Today I was on the treadmill. I know, shame on me. But I did a 4 mile fartlek (hehe) workout that I wouldn't have done had I been outside. I am thinking I may add a track workout later this week. That looks like a fantastic place to run! Did I mention that I'm originally from TN? I bet it's gorgeous there right now. No shame on a treadmill run, you do what you have to do to get the miles in, good job! It looks like a beautiful run. Well, except for the sewage plant part. I should note that the picture of the art museum was ganked from the Chamber of Commerce website. I wish my camera could take such a lovely picture. It was such a hot and dry late summer that I think the leaves on the trees are going to just die. No pretty colors. We might be skipping fall and going right into winter.